More on the "Special Relationship"
Around this time in the Torah reading cycle, I tend to comment on the complex interdependence between Judaic and Western culture and what has come to be called the "Special Relationship". An entry on this topic has been a perennial favorite and has gathered some attention in the blogosphere. At the center of the issue is how to understand the Jacob-Esau typology. Jewish centers tend to see the relationships between Yakov and Esau as emblematic of the relatiionship between Jews and Christians, between Jerusalem and Rome, and between the Judaic and Western civilizations. At its heart is the tension between being brothers and being competitors and rivals. This rivalry lies at the heart of geo-political, spiritual and eschatological struggle between these two borthers. At time, their rivalry overshadows their love with bloody consequences, mostly to the Jews, and at other times, their familial closeness reasserts itself, drawing the younger brother Yakov into the orbit of the powerful older borther, Esau, resulting in assimilation, acculturation adn conversion. An important footnote to the entire topic is how Esau stands for the entire Western civilization. The approach that I pioneered and that has now been adopted by several recent books is that Western civilization exhibits many outstanding traits of Esau, as he is described and presented in the Torah. The identification is moral-spiritual, not familial. An older approach, that of Ababanel in Yeshuos Meshicho and in his commentary is that there is, in fact, a familial relationship. "The great kingdom of Rome was built by Zepho, son of Eliphaz, son of Esau. Tirtat of the land of Elisha attacked him and killed him (Yelamdeinu, Batei Midrashos 160)." The Malbim in his commentary to Obadia 1,1 suggests that in addition to genealogical descent, the identification of Rome and Esau is also based on the "founding of their faith by children of Edom, as R. Isaac Abarbanel wrote to Isaiah 34, with proofs." I wish to add a footnote to this point. I have recently been reading an intersting new Hebrew sefer (not an acaademic work), entitled"Meshichei Hasheker umisnagdeihem (False Messiahs and their opponnents). It is a work that comes out of the Lithuanian sector and includes chapters on well-known "messiahs" like Shabsai Tzvi, Nechamiah Chayun, David Reubeni, Jacob Frank, Chaim Malach. Yehuda Hachasid from Vilna and many others, well known and obscure. Curiousely it does not include Abraham Miguel Cardozo but does include Napoleon Bonaparte and Theodor Herzl. In the chapter on Yeshu, he quotes from several sources that the Christian religion first spread among Edomites, and only later among other Gentiles (p.128). This is brought by R. Avraham ben Harambam, Ramban in Sefer Hageula, Abarabanel in Yeshuas Meshicho 1, Rashbatz in Magen Avos 8:2. He also brings an interesting midrash, which may be the source for this approach: "Why does it (cross) have two heads? Because this Yeshu grasped two heads, of Israel and of Edom...(Osios D'Rabbi Akiva Vertheimer, p.112). In this approach, Christianity is identified with Edom simply because it was the Edomites who converted first. Although this is not the picture that we see in the Acts of the Apostles, it may well have had a historic basis in the pre-Acts years. The aforementioned sources also indicate that it was after that the Edomites accepted the Chrsitian beliefs, that Paul took a version of Christianity that rejected commandments and allowed worship of images to other lands. Of course, this approach pretty much removes cosmic significance from the Jacob-Esau axis, which is may be why it is not more widespread and why you and I have not heard of it before. How do Christian exegetes view the Genesis stories of Jacob and Esau? They certainly cannot identify with Esau because Malchi 1:2-3 says that G-d hates Esau and loves Jacob. Not being an expert in this area, I believe that they select "local" or devotional explanations of the story but not a typological one. Hebrews 12:15–16, depicts Esau as unspiritual for thoughtlessly throwing away his birthright, betraying traces of Jewish traditional understanding. Rachel and Leah are the two mothers who together built the Hose of Israel. Yet they are different - in personality, spiritual characteristics, and effect on the generations to come. A deeper perspective on Rachel and Leah needs to take into account and explain one Kabbalistic fact. Surprisingly, in Kabbalah, Leah is higher and superior to Rachel. The partzuf of Zeir Anpin is composed of a higher part, Isroel Sabba and below it Yacov. Wrapped around them is Leah above and Rachel below. Leah is generally facing Isroel Sabbah's back whereas Rachel is sometimes front to back and sometimes front to front to Yakov (see Shaar Hakkavonos, Krias Shema). Without getting sidetracked by these intricate ideas, one thing is clear - Leah is higher than Rachel. That is not the perception we get from the Chumash, where Rachel seems to be more valued than Leah. Ruth Rabbah 7:13 points out that even descendents of Leah, Boaz and men of Bethlehem mention Rachel before Leah. Michtav M'Eliahu suggests that Yakov and Isroel represents Jacob as he functioned in the lower and higher realities respectively. 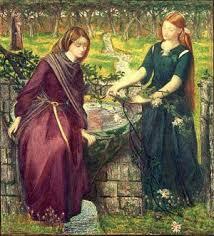 "Also Rachel and Leah correspond to two particulars in Divine Service.. Rachel. "the beautiful of form and beautiful of visage" (in the words of the Zohar - the revealed reality) is the revelation of God's Glory in this lower world. Leah stands aside (the eyes of Leah are weak - the world of the hidden) - her portion is what is revealed in the sense of the higher world, the hidden one (2:218)". The Artscroll Chumash adds derives from this an appealing idea. When Yakov saw Rachel, he immediately knew that she was his partner in this world. The same was not the case with Leah. She was his partner in spirit but at that stage of his growth, he did not yet see it. He would only see it later in his life. Rachel was she whom he needed at the time, but Leah was his destiny for eternity. It is she who produced Yehudah and Royalty and Levi and the Priesthood. So often we see only with eyes of the flesh. Rachel was right for him as he was, Leah was destined for him as he was going to be. So often we rail and complain against Divine injustice in not giving us something that we want, forgetting that God, in His kindness, may be instead giving us what we need. It's a great segula for Sholom Bayis to remember that the wife that Hashem may have given you may not be the one that you wanted but she is the one that is good for you. A Jewish wife is not a wife who will make you feel great and cater to your every whim and behind your back does G-d knows what. A Jewish wife is supposed to challenge you. She will challenge you, stretch you, shine light on your deficiencies, make you GROW! I often think of R. Yisroel Salanter. Here is a man who by all contemporary standards was a failure. His career as a Rosh Yeshiva ended with having to go into exile. He spent most of his life in Western Europe, and making very little difference. It is almost an afterthought, a few students who he taught his Mussar doctrine, who created in his name a revolution in the Jewish world. Sometimes it is the insignificant actions that we completely overlook and do not value that may earn us Eternity. The Lubavitcher Rebbe (quoted in the Gutnick Chumash) had a different approach. He saw Rachel as representing tsaddikim gemurim, hence her beauty of appearance and stature. Leah, on the other hand, represents Baalei Teshuva. That is why she cried a lot. It is for this reason that, as Rashi points out, everyone thought that she was an appropriate wife for Eisav. Like Eisav, Lea went out, a trait that "came out" in her daughter Dinah. That is a trait of Baalei Teshuva who actively seek to cause others to become Baalei Teshuvah. Underlying this approach maybe is the Kabbalistic tradition that Leah is higher than Rachel and the statement (Brochos 34) that in the place in which Baalei Teshuvah stand, tsaddikim gemurim cannot stand. The book, The Dawn of Redemption: What the Books of Ruth and Yona Teach about Alienation, Despair and Return was reviewed by Mattan Erder in the last issue of Jewish Bible Quarterly. This review touched upon and discussed several crucial issues of methodology and hashkafa in regard to how Orthodox Jews may approach Nach. It posed questions about whether it is legimate for frum interpreters to incorporate or discuss academic and Christian Bible scholarship, whether archeology and comparative linguistics, history, hermeneutics, literary criticism and other "modern" approaches have a place in the study of Nach qua "Talmud Torah", and whether the Bible should be viewed as a purely historical document or as a guide to religious life. Because of the importance of these topics, avakesh asked R. Meir Levin to respond to the review. We present this discussion in an interview format. Avakesh: Your book was reviewed in the Jewish Bible Quarterly. Were you pleased with the review? RML: Yes. It was a fair and informed review that both understood the book and stated clearly what its ideological disagreements were with it. Avakesh: Rabbi Erder wtires: "Controversy about methodology and hermeneutics has always been a prominent feature of biblical studies. Recently, there has been a vigorous debate as to whether the stories in the Bible are primarily etiological or ethical; whether it makes sense to read the Bible as a source of instruction, or if it should be viewed primarily through a historical lens. While not explicitly, and perhaps not consciously, addressing this debate, Rabbi Dr. Meir Levin's new work The Dawn of Redemption: What the Books of Ruth and Yona Teach about Alienation, Despair and Return (originally a series of articles on www.torah.org) makes a powerful statement in favor of reading the Bible as a source of guidance and instruction on the most crucial issues of life. As the title of the book and his preface indicate, Levin's primary concern is to elucidate the Bible's messages about a certain set of pressing human concerns in a way that will furnish the reader with guidance and new perspectives. Levin's goals combine with his chosen interpretative strategies to create a blend that is unique and often refreshing. In addition, he is forthright about methodology, stating exactly what methodological choices he is making and why he makes them. Levin makes extensive use of rabbinic literature to elucidate the texts of both biblical books, although this tendency is more pronounced in his commentary to Ruth. This choice means that, in addition to his own considerable talents, Levin has placed the textual, psychological, historical and spiritual wisdom of the entire rabbinic tradition at his disposal, and his commentary is much richer for it. " Avakesh: Do you believe that the Bible is an instructional document that educates us to how a Jew should think and by what he should be inspired? RML: Yes, with the caveat that this is how Chazal saw it. The whole institution of Midrash is predicated on the assumption that Tanach is a repository of moral, religious and spiritual teachings. When one utilizes modern approaches, he automatically removes himself from this position and enters the interpretative world in which understanding of the environment, mentality and history of the Biblical period is what is paramount and not the message for the individual, nation and humanity. Avakesh: So it is fine to use these approaches but it is not Talmud Torah. RML: Let me state from the beginning that academic Bible study is scientific. Science in our day is reductionist. It aims to take every phenomena apart and through this understand how the smallest building blocks combine and function together, and it hopes that thusly, the whole will be understood as well. Judaism, on the other hand, is integrative. An yeshiva bochur can say a chiddush that explains a Shach, which then elucidates a disagreement between Rishonim, and throws light upon a Tannaitic dispute or contradictory Biblical verses.Talmud Torah means reconcling contradictions and bringing everything together. Hashem is One and His Torah is one. That doesn't mean that scientific approaches are not OK, but it does mean that when a frum interpreter uses them, he must not allow himself (or herself) be seduced by their explanatory power and placidly accept the conclusions to which they may point. Should he choose to use these methods, he must consciously employ them toward a goal that is different from the goal to which their proponents, adherents, and academic Bible experts use them. It may not be very scientific but it looks scientific, and only in such a way is it Talmud Torah and not academic scholarship. Avakesh: R. Erder is surprised that in your commentary to Yonah, "he also seems more willing and eager to interact with modern biblical scholarship. This results in discussions of linguistics, archaeology, and theme in which Levin engages various viewpoints that depart from those of traditional rabbinic Jews. In these discussions, Levin takes on what can best be described as an open, confident, but very Orthodox approach: he feels free to utilize the insights of modern scholars to further his understanding of the text, and equally free to reject their views and arguments when they conflict with his broader vision and worldview. " RML: Yes, except that I wrote in the introduction to Yonah that there are much fewer Chazal's on Yonan on Ruth and I, hterefore, had more "space" to consider these issues, not that it is a different method. Avakesh. He did write that, "he is forthright about methodology, stating exactly what methodological choices he is making and why he makes them". RML: I think that methodology is important, no, it is everything. Before any commentator takes on the task of elucidating a book, he or she must clarify the assumptions and intepretative method to be used. Shadal does this well in this introduction to Chumash and Ishaya and so do many other commentators; even those who do not, clearly have an approach that becomes apparent if you look for it. An interpreter constantly makes choices. One will make ad hoc, eclectic and unenlightened choices, or he will make these choice in a prospectively defined fashion, fully reasoned and compatible with a pre-existent set of assumptions. That is what makes a good commentary - predictability, constancy, committment, consistent and reasoned approach. Avakesh:...and in this case the assumptions arise out of Chazal? RML: Out of a particular approach and understanding of Chazal. Avakesh: Is that why you speak of Chazal as a monolith. R. Merder criticizes that. He writes: "Throughout his discussion of the book of Ruth, he refers often to the "view of the Sages" or to "the Sages' interpretation," in a manner that seems to present the entire classical rabbinic tradition as a monolith. This language has the potential to blur the significant diversity that characterizes the rabbinic works that are utilized. Texts as different from each other in their provenance and orientation as the Babylonian Talmud, Midrash Rabbah, and Zohar Hadash are all quoted equally as representing the uniform view of "the Sages." Furthermore, Levin makes almost no use of any debate or disagreement between different rabbinic views in his commentary to Ruth. In the rare cases when he does mention rabbinic disagreements, it is usually only in order to emphasize the common denominators between the various interpretations. This is one unfortunate respect in which Levin under-utilizes the rabbinic sources, there is much to learn from the disagreements and debates between the sages, and attention to those debates could uncover even more nuanced and multifaceted readings of the texts at hand. In any event, while the rabbinic sources Levin cites are certainly extensive, they are not comprehensive enough to sustain the claim that they represent the exclusive view of "the Sages." This criticism, of course, does not detract from the substance or rabbinic authenticity of Levin's insights. Rather, the issue is that some of the language used to express these insights may impose a false image of uniformity on a diverse body of literature. " RML: Well, part of it a deliberate insistance on that the Sages do have a common point of view and that this view is central to their Weltschaung and not haphazard or dependent on the personality, social class, or some other peculiarity of an individual Sage, and also because I do believe that Sages agreed much more than they disagreed. The inclination to emphasize disagreements betrays a non-Orthodox bias, a belief that Oral Law is "made up" and that it is merely a collection of individual opinions. Avakesh: You really think so. RML: I do. We always speak of roots and branches and how one who is committed to the Divine origin of the Torah sees areas of agreement as more securely of Divine origin than disagreements, which are also from Hashem but in a different way. You yourself wrote about it. I remember hearing that in his younger years. R. Y.D. Soloveitchik used to spend time during his shiurim demonstrating that disagreements in the Talmud were predicated on common assumptions and shared much more than they did not. Avakesh: So you think that people who are allergic to the term "Sages" have an agenda. RML: Not always. I dont think so in this case. They may just not recognize the ideological basis for this objection, which I have encountered before and from less sympathetic quarters. Avakesh: What were you trying to accomplish with your book. RML: Many things. I wanted to demonstrate that one can be frum and write a sophisitcated and informed commentary, one that is faithful to Chazal and inspirational to the modern man. I tried to do something different, to blaze a trail, to show how sophisticated literary techniques can be combined with inspirational message based on Chazal, how modern hermeneutical techniques can add value to the Talmud Torah aspect and not in any way detract from it. I tried to write a kind of a commentary that modern man can appreciate and by which he or she can be spiritually uplifted but that would still be based on solid scholarship and be understood and respected by scholars. Above all, I wanted to uplift Kavod Shomayim by showing that Hashem's Word is relevant and deep even in our age. Avakesh: R. Merder says that not everything in the book is Pshat. RML: I learned many things while writing this book. One of them is that, in Nechama Liebowitz' words, "Pshat is what I say it means. Drash is what you say it means". The fact remains that if you start from a set of exegetical assumptions and encounter a verse that seems to contradict these assumptions, there are only two choices. You must be willing to either reconsider your assumptions or you must be willing to reconsider the meaning of the verse. If you are an academician, you may emend the verse, chas veshalom. You have no choice but to explain that verse in some other manner, which you will call "omek hapshat", allegory, poetic license or some other variety of pshat. It will be not the apparent but the real meaning of the verse, for the apparent meaning is false by the virtue of assumptions that you employ. Someone who starts from a different set of assumptions will call your interpretation drash. This is simply the nature of hermeneutics and there is no way to escape this conundrum. There is a very grey and very long transitional area between pshat and drash. RML:On the contrary, thank you for this opportunity. We all know that "the seal of the Holy One Blessed Be He is Truth (Shabbos 55 a)". Chazal held falsehood to be abhorrent and the Talmudic sages spoke strongly against dissembling and cheating. On the other hand, there are situations when carefully designed misstatement is permitted (sources here). In Tanach a similar situation exists. On one hand, Hashem abhorrs a liar (Psalms 5:5-6) and "The remnant of Israel shall not do iniquity, nor speak lies; neither shall a deceitful tongue be found in their mouth" (Zephania 3:13); on the other hand, Genesis is full of deceit. Take as an example Abraham and Pharaoh and Abimelech, Yitzhak and Avimelech, Yaakov and Yitzhak, Rachel and Lavan, brothers and Yakov, Tamar and Yehuda, Yosef and the brothers and on and on and on. Let's not forget Moshe and Pharaoh either. How does one explain this? There are, of course, "local" explanation for each case. However, I venture to say that in Tanach, dissembling or what we call now "geneivas daas" is seen as justified when it is used by the weak against the strong. After all, the weak cannot match the power of the strong, and each one can legitimately use the means and weapons in their disposal. Let the strong give up their power and then the weak will give up their deceits. The weak, as is believed in every culture and every time and place, have a right to protect themselves as best as they can. Deceit is often the only weapon they have against an opponent that they cannot otherwise match. To this day, that lying is appropriate on the part of the weak but repugnant when utilized by the strong to augment their already existing advantage, is a prominent feature of the Mediterranean culture. The idea that lying is always wrong made its way into Western culture from the age of chivalry and the spirit of Eisav. Later Kant enshrined it as an ethical principle basd in his absolutist system of ethics. The case of Abraham adn Paroh is clear. In regard to Pharaoh and Moshe, Rashbam explains that Pharaoh could never accept teh demand to let Jews go forever. He was simply psychologically incapable of acceding to such a demand. I would say it is as if an Indian Chief showed up on the front lawn of the White House demanding the state of Arizona because the Great Eagle sent him. Moshe had to proceed step by step; there was simply no otehr way. I believe that every apparently tolerated, excused and accepted occurrence of deceit in Tanach is in a situation of weak defending themselves against the strong. Every ocurrence that is explicitly or implicitly tagged with opporbrium (like Lavan's use of falsehood against Yakov), is when the strong use it to opress the weak. In other words, injustice is worse than falsehood. Why then will the remnant of Israel not speak falsehood? Because they will rule the nations and that is the implied context to this verse. An interesting post about the attemtp to bring punctuation into the Biblical text, here. This brings me to a point that I consider important. I think that some of the repetition of modifying phrases and some of the features of text arrangement that Bilbical critics see as evidence of duplicate versions and editing, is nothing more than a substitute for punctuation. For example, the famous "leimor" may be a substitute for a colon. One can say," And Moshe said:..", or if you have no such puctuation available, you would say, "And Moshe said, leyomor". Rashbam in several places (see Noach in Lokshin's edition), says as much. He says that "leyomor" is equivalent to a repetition of the previous verb in the sentence. Instead of a paragraph, one may find the repetition of the last phrase of the previous sentence. Instead of an exclamation mark, you have a doubling of the verb form (harog t'hargeinu) etc. It would be an interesting exercize tor rewrite Biblical text omitting these devices (after they are first catalogued) and introduce contemporary punctuation marks and then see how much of the Biblical critic's armamentarium simply falls off.